AdPixo is a and innovative pop under advertising network dedicated to work exclusively with premium pop under ads. AdPixo guarantees clean and high quality of ads having 100% fill rate. Although they are new, they have a good number of features to attract advertisers and publishers. 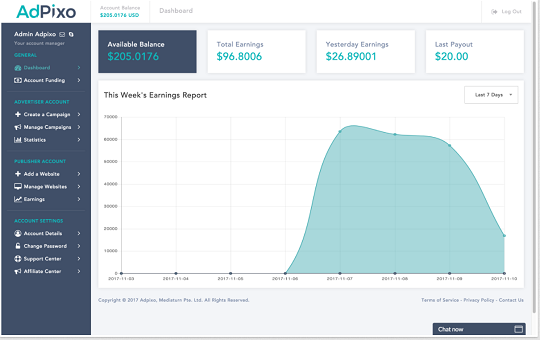 AdPixo is loaded with a user friendly dashboard, real time stats, dedicated support, referral system where you can earn more. They have setup their own ad server technology. Publishers keep 85% of revenue shares, faster domain approval process. You can add non adult as well adult websites and they will be approved. You can request payment any time having a minimum balance of $10. You can get paid via Paypal, Payza & Bitcoin. For advertisers, you get clean traffic directly from publishers. AdPixo has inbuilt conversion tracking system so that you have complete control over your campaigns and conversions. AdPixo has various targeting options and the minimum deposit is only $10. They ad server can detect fraud traffic pretty efficiently. AdPixo is an ad network working exclusively with premium pop under ads. We guarantee clean & quality ads, 100% fill rate, quick payments and great revenue. AdPixo is delivering daily millions of pop under ads across the web using a powerful ad serving platform. With high CPV & affordable premium World wide traffic. In-built advanced S2S conversion tracking system, so there is no need of any external applications. Advertisers get full control on their campaigns and publishers get full access to all the premium ads based on the quality and quantity of their traffic. You can enjoy a large volume of traffic to your landing page at the fraction of the cost. AdPixo is an ad network working exclusively with premium pop under ads. We guarantee clean & quality ads, 100% fill rate, quick payments and great revenue! AdPixo is the perfect partner to work with. We work only with premium publishers and ad networks. For us, client satisfaction is the top priority.